The existence of the Great Bog Snapper is unquestionably not a great one, being so lackluster that it spawned the common saying “Only swamp rocks and water today”, which remains to be used to Anglian hunters to describe a lackluster trip. Baring a size far more massive in comparison to an everyday snapping turtle, the Snapper is exclusive to only the swamps and bogs of Anglia and its surrounding regions. They are relatively easy to find due to their sheer size and lack of migration. Because they are dormant for the majority of the day, and only to snap out at any small prey to come near, it is no wonder these turtles are described as large stones. The Great Bog Snapper was discovered during the expansion of the Regalian Empire across the archipelago it thrives on today. Groups of explorers trekked across the wetlands of Anglia, finding what appeared to be “Large, muddy, jagged rocks.” A curious excavator of the group had moved to break through one of these "rocks", only to have his boot torn through, and multiple toes broken by snapping jaws. The weight a snapper’s shell is able to withstand is still unknown to this day, with one of the males of the species having been found after a major storm with a massive tree having fallen atop of it. This elder tree had weighed in at roughly ten thousand pounds. Exclusive to the swamps of Anglia, the Great Bog Snapper is as boring and active as its nickname implies. Today, these turtles are rarely hunted and have no natural predators due to their shell, and the fathomless difficulty of flipping one over from the mud. This has caused the steady increase in their population, with little sign of a curb throughout the years. Despite hunting being a useful solution to their ever-growing population, the species is only sought after by those who want their shell as a trophy, or perhaps furniture. The Great Bog Snapper resembles much that of a massive tortoise, though with a much thicker, ridge covered shell. The domed shell, having a murky brown coloration, is topped often with moss depending on the turtle’s age. The underside of the shell having an arrow shaped pattern of pale yellow bone plates, it is almost never seen. The skin of the turtle is a deep, swampy green with mixes of brown and grey hues. Their triangular heads are roughly the size of a fist, with the exception of a large beak making up either their lower or upper jaw. The black, beady eyes located on the very sides of the head are barely visible due to their miniscule size. A stubby tail protrudes from beneath the underside of the rear end of the shell, accompanied with just as stubby feet. Their elephantine leg structure allows for slow but sturdy movement to support their immense weight. Overall, the Great Bog Snapper has been recorded between 4’6 to 5 feet tall while standing, and weighing in at an average of around a full ton. Their shell is four feet in length and 3’6 feet in width, with the bone measured astoundingly between two and three inches thick across the entire dome. While the texture of the shell is surprisingly smooth (comparable to a river stone) the turtle’s skin is much more cracked and rough. Females and males of the species have a two distinctive differences, the first of which is far easier to see; their beaks. Simply put, males have an overbite beak, while females have an underbite. The other distinction is their shell’s underside. With the arrow pattern forming between the plates on the underside, males have their pattern pointing toward their tail, and in opposite, the females have their pattern pointing headward. However, the species lack any discrepancies in terms of t behavioral differences among females and males. Upon fertilization, Great Bog Snappers will wait around a full week until laying their eggs. They tend to lay their 15 to 20 eggs in hills or mounds, in an elevated area away from any potential flooding of the wetlands. It takes half year of incubating beneath the soil until the eggs hatch. Instinctively, the hatchlings will follow the scent of the wetlands while starting a diet of leaves and vegetation. Hatchlings have a completely smooth shell, while having a brighter green coloration all around. After a span of 5 years, the turtle will reach a full size and maturity. At this point, their diet would have transitioned into the consumption of smaller creatures. Both males and females live up to a maximum of 150 years, usually to die of old age. Though they do not show intentional aggression toward people, Great Bog Snappers will instinctively attack any small creature in range of its bite. That being said, any Klienfolk would be wise to not near a Great Bog Snapper. Being untamable, they would be miserable in any given domesticated environment if captured. Other than this, they are rather docile and stagnant in nature unless provoked. Great Bog Snappers are aggressive toward one another only when prey is involved. If two or more of these turtles collectively capture the same prey, it is not uncommon to see them biting at the necks of one another , albeit smacking their beaks together half the time as if they were fencing. If threatened, they dig their feet into any dirt or mud around them, effectively planting themselves in the ground, while retracting their head and tail inside their shell. While always seen in groups of around twenty turtles, this is often for the sake of creating a tough environment for small creatures to hop around. This grouping allows for a higher chance of a small fauna to get close enough to the striking zone of one of the turtles. Though in groups, they do not have a set territory and are apathetic of larger creatures or people passing through, even if the turtle notes of their presence. Males are typically positioned around the outside of the grouping, with females drifting more toward the center. Though the Great Bog Snapper can remove a finger or toe easily, it has never actually happened. It is speculated that they stop their bite halfway through when realizing what they have bitten is too large to consume. There have been instances of using the shell of the Great Bog Snapper as a shield, though the shell itself is so heavy that only an Orc can effectively use it. 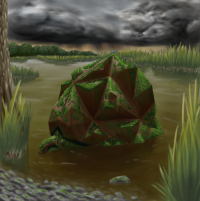 Certain scholars theorize that the Great Bog Snapper is originally from Daendroc, with the reasoning that their shell would provide more usefulness in the hostile jungles, as their coloration in the mass vegetation would be a suitable camouflage. This page was last edited on 25 March 2018, at 11:17.